Yahoo! 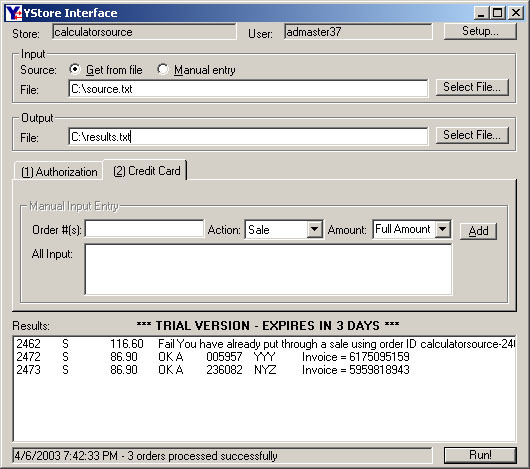 Store Automation - Credit Card Interface: Automatically Charge Yahoo! Store Orders! 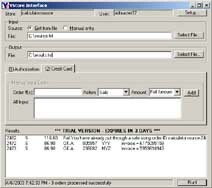 Credit Card Interface is a YStore Inteface module that gives you simple, secure, automated access to Sale, Credit, Void Sale, and Void Credit functionality available on Yahoo! Store order pages. With this interface you can finally automate charging and refunding customers' credit cards through the merchant system already used by your store. Provides automated access to the Amount field and to Sale, Credit, Void Sale, Void Credit, and Reverse Authorization buttons for all your Yahoo! Store Credit Card orders. For PayPal orders provides automated access to the Amount field and to Capture, Refund, Void Authorization, and Reauthorize buttons. The same interface is used for Credit Card and PayPal orders. Allows to specify 'Full Amount' to automatically charge/refund what the customer owes without you having to know what that amount is. Automatically defaults to Sale/Capture for Full Amount if only the Order # is provided as input. This allows using order export files without having to convert them to a different format. Allows your staff to charge or credit orders without gaining access to the Store Manager or customers' credit card information. Guaranteed Chargeback Protection Worldwide! No AVS Required, Transparent, Automatic! Tired of Unreliable Email Forwarding and DNS? Switch to easyDNS and forget about lost emails and frequent website outages. They are widely recognized as one of the best in the business! Recover from Lost Broadband Connections automatically using this innovative hardware and sofware solution. Perfect answer to unreliable cable modems, DSL modems, and wireless routers! Automatic IP Location Lookup in your online and offline applications is easy with these accurate, comprehensive databases and lookup services. Find country, state, city, ISP, longitude, latitude, flag, and domain. Copyright © 2003-2019 intelliHoldings. All rights reserved. intelliHoldings and YahooStoreAutomation.com and its products are not associated with or endorsed by Yahoo! Inc. Yahoo! and Yahoo! Store are registered trademarks of Yahoo! Inc. All other trademarks are the property of their respective owners.